I enthusiastically commend to you Rod Dreher’s new book How Dante Can Save Your Life. It’s a fascinating, joyful, sobering and at times deeply moving testimony of power, not only to the The Divine Comedy in particular but to literature in general. Rod calls himself a “witness” and not a scholar. That’s the idea, but I would nonetheless urge literary scholars to read his book and savor the way a medieval text can speak so pertinently into a 21st century soul. 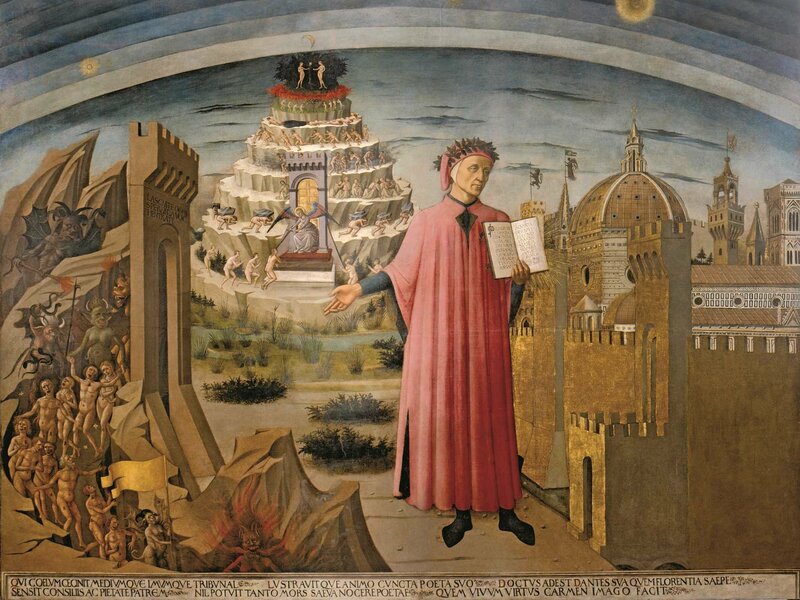 How Dante Can Save Your Life is Dreher’s tale of how the The Divine Comedy came into his life at a time of personal crisis and, through its parable of ascent to God and love from death and darkness, healed his soul. I won’t spoil any of Rod’s story for you; it’s more rewarding to follow with him in his narrative and see how the poem astonishingly overlapped with his personal journey. Rod’s book isn’t just about Dante. It’s about the healing power of literature and the tether between our imagination and our souls. It’s easy to think that the people who ignore this connection tend to be non-readers in general, but it is actually quite possible to be a voracious reader and miss the existential value of literature completely. In fact, there’s a good name for people like that: Seminarians. I say this from experience. In high school I devoured English literature classes. In those years I discovered the wit of Jane Austen and the moral fortitude of Harper Lee. It was in high school that I first fell in love with the written word. I went to college at a seminary undergraduate school. The curriculum emphasized theology, biblical studies and ethics. Now to be sure, my college years inflamed my love for books and reading. But there it became a monolithic love. Every single class reading assignment of my degree was nonfiction, excepting two semesters of mandatory “Great Books.” It didn’t take long to pick up that, at my college, fiction was “pleasure reading” and a luxury, often one unattainable in the busyness of a semester. For most students, this was considered a very minor inconvenience. No one really questioned whether a minister-in-training needed to be focused on nonfiction and theology. The immediacy of Greek exegesis, substitutionary atonement, and biblical counseling made the imaginative wanderings of Mark Twain look like a pleasant diversion at best and a waste of time at worst. Of course, no one explicitly talked down literature (especially if it was that of C.S. Lewis or J.R.R. Tolkien). But the point of the academic culture was not lost; when it comes to pastoral training, fictional stories are optional. I felt this at the time but often struggled in explaining the reasons why. That’s where Rod’s book is so helpful. I knew that the stories of literature had helped me in my own life but I couldn’t discern the difference between the value of the literature itself and the value of the metaphors and spiritual application. I could easily explain why Christians should read The Lion, the Witch, and the Wardrobe (“It’s an allegory for the Gospel!”) but I couldn’t easily explain why they should read The Remains of the Day. How Dante Can Save Your Life is helping me understand that the spiritual lessons in literary metaphors are inseparable from the medium of literature itself. The truths that Rod gleaned from The Divine Comedy have been and often are said in a straightforward, nonfictional way, but that would have depletes the Commedia of much of its power and likely would not have illuminated Rod’s life the way it did. Literature is essential for ministers because the Bible is literature too. The Gospel is story and all good stories participate in the same kind of transcendent moral power that the Gospel defines. A preacher who “has no use” for fiction thinks he is privileging truth over fairy tales but in reality he is privileging the mind of man over the mind of God. Worse still, he is robbing his congregation of the emotional and spiritual health that comes from a warm and well-used imagination. Seminaries should be a place where pastors are equipped to be as intelligible in great stories as they are in great polemics. The human soul requires both. [T]he books I have read over a lifetime have shaped my worldview, my beliefs, and my life as much as anything else. From Great Expectations I learned the power the stories we tell ourselves have to do either harm and good, to ourselves and to others; fromDeath of a Salesman I learned the dangers of a corrupt version of the American Dream; from Madame Bovary, I learned to embrace the real world rather than escaping into flights of fancy; from Gulliver’s Travels I learned the profound limitations of my own finite perspective; and from Jane Eyre I learned how to be myself. These weren’t mere intellectual or moral lessons, although they certainly may have begun as such. Rather, the stories from these books and so many others became part of my life story and then, gradually, part of my very soul.